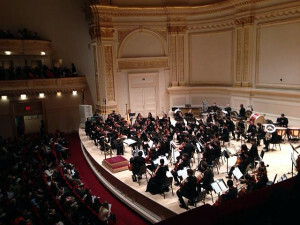 as part of the New York Youth Symphony’s 51st Season, and featuring the world premiere of Against the Shrieking City Air, by Loren Loiacono. Just in her 24th year, Loiacono received her degrees from Yale U. before embarking on her current pursuit of a Doctorate in Composition at Cornell. A native of New York City suburbia, the inspiration for this new work came from her experiencing the marked difference in environment as one travels farther from the audible airs of city life, to the almost alien stillness of the country. While the strings and reeds were used by Loiacono to establish a kinetic flow, various strains of harmony would be interrupted by brass and percussion, in sudden left turns, or cutting across town, as it were. Ultimately a whirlwind rose frenetic and unceasing, yet one without darkness or danger. There was no malice in the maelstrom, just the exhilarating risk of being overwhelmed, if not drowned. And at the crest of it all, it falls away, with but one minor surge before the exhalation, as tensions fade quickly into a subdued calm, quiet enough to hear the country crickets, had she chose to add some. It was a very impressive piece, no less so for one just starting their career as a composer. The title is lifted from the 1921 three-stanza poem City Trees, by Edna St. Vincent Millay. The poetess remarks on how the city trees “would make a sound as thin and sweet as trees in country lanes” if it weren’t drowned out by all that going on around them. And Loiacono provided a stimulating and enjoyable exploration of this idea through orchestral music. I just wish we didn’t have to leave her calm countryside as soon as we did. 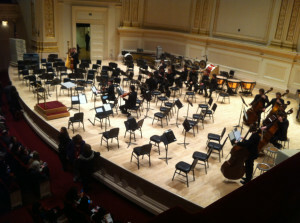 The second offering featured a most impressive Carnegie Hall debut by the guest artists, Pleasure is the Law. Taking their name from a Debussy quote relating to inspiration trumping traditional rules of music, the quartet features the traditional Baroque alignment of flute, oboe, cello, and the piano standing in for the harpsichord, but dedicated to exploring the contemporary repertoire. They joined the orchestra for the rarely performed Quadruple concerto (Concert à quarte) by Olivier Messiaen. Messiaen often composed with color in mind, and this effort to score music based on bird calls was done in blue, represented by the key of A Major, and signifying joy and ecstasy. Dying in 1992 before its completion, his widow took up finishing the work, which debuted two years later. With Nadine Asin on Flute, Elaine Douvas on Oboe, Darrett Adkins on Cello, and Steven Beck on Piano, Pleasure is the Law represented specific songbirds, and briefly Messiaen himself. With a nod to Mozart in the first section, the piece evolved to something full of abrupt changes in rhythm and tempo. Like a boisterous canopy flocked with chattering birds, it was a very different slice of nature than the serenity imagined by the concert’s opening selection. Remarkable to watch, this very young orchestra, with some members clearly no more than 12 or 13, stayed right there with the mature professionals across an edgy, challenging piece of music. It also provided them an opportunity to play additional instruments, like the marimba among the percussion, and even the tinkling chimes of a celesta. The amount of dedication and rehearsal necessary must be enormous, for those participating in what are essentially after school commitments. And the performance from every member of the orchestra was excellent. Sweeping and romantic at the start, with wisps of reeds floating on a breeze of sighing violins, it grows tall with trumpets before returning to repeated interplay between the strings and woodwinds, melancholic and bordering on the tragic. The second movement is ushered in by the horns, and then a plodding plucking of strings like a horse cart climbing its way further into the mountains sets the mood for the pensive woodwinds. The horns return with unhurried pomp, like plump clouds, or perhaps the Alps themselves frowning down on the clarinet and flute fluttering below. All so very Austrian, even after the strings awake to saw their way down to the ballrooms and courtyards of Vienna. But then, Brahms wrote it while sojourning in an alpine village. The regal third movement with its uplifting signature theme from the brass and the leaping fiddles proved every bit as thrilling as I had hoped. And the final movement of bass and timpani-driven passion was set off very well by the sensual interludes between the principal flute, clarinet, and oboe, at times overlapping as they sustain and tumble downward, with almost Beethoven sonata-like moments, and a chorus of trombones offered a grounded presence, when not punctuating the rousing crescendos leading up towards the final rush to the ending precipice. Most satisfying. Musical Director Gersen deserves considerable acknowledgement for finding eclectic music that will challenge and expand the experience of these young musicians, and for leading the orchestra to achieve such a successful performance. They are all to be congratulated. But I should mention by name Joseph Morag on violin, Shaquille Southwell, clarinet, Rachel Susser, flute, Liam Boisset, oboe, and Aron Szanto on cello. And special mention goes to Ayden Michael Khan, the percussionist deftly handling the timpani and chimes. But from my box, I also thoroughly enjoyed watching the young man on the contrabassoon, an unsung hero if there ever was one. NYYS performances are highly recommended as a stirring and affordable cultural experience for all ages. More information on the NYYS can be found at their website http://www.nyys.org/ including ticket information for their upcoming Jazz Orchestra concert at Lincoln Center on March 10, featuring guest hornman Terell Stafford, and the chamber music concert at Symphony Space, April 23.